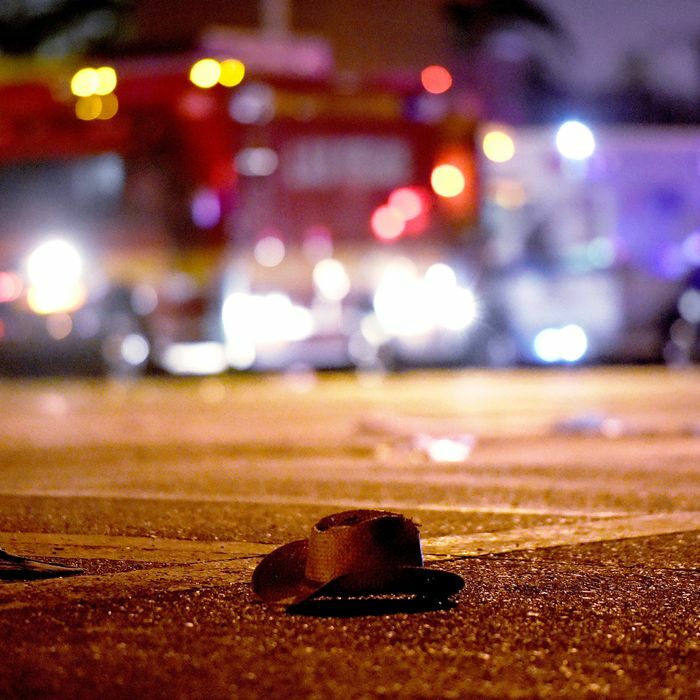 A gunman opened fire in Las Vegas on Sunday night. A gunman opened fire on a crowd at a country-music concert in Las Nevada, Nevada, on Sunday night, killing at least 58 people and injuring more than 500 in the deadliest mass shooting in modern American history. Amid the horrific rituals that accompany large-scale massacres, which punctuate American life more often than they used to, there were some details about the alleged murderer, Stephen Paddock, that immediately stood out. One was his age: At 64 years old, Paddock was much older than the average perpetrator of mass shootings. The second was the weapon he reportedly chose to carry out his massacre. Many experts speculated that Paddock used a fully automatic rifle, a highly unusual weapon for a civilian to obtain. The Wall Street Journal reported on Monday afternoon that 18 to 20 guns, some of them automatic, were found in Paddock’s hotel room on the 32nd floor of the Mandalay Bay hotel, from which he fired into the crowd. The New York Times reports that among the weapons were also AR-15s, which are semi-automatic. Paddock reportedly smashed two windows in his room, and set up two scoped rifles with tripods to shoot out of them. Fully automatic rifles, which have been common in warfare since World War I, allow the shooter to shoot nonstop, with no need to keep pulling the trigger. (They are similar to, but can differ subtly from, machine guns.) In disturbing video clips of last night’s shooting, a nonstop patter of gunfire can be heard coming from the hotel, followed by periods of silence. The pattern led analysts to believe that Paddock was using (and repeatedly reloading) an automatic rifle. It’s also possible that Paddock modified one or more semiautomatic rifles to fire automatically, in a process known as “bump,” or “slide fire” — though doing so reliably is difficult because the guns often overheat. And some experts said the firing heard in the audio was too rapid to have come from a modified rifle. Semiautomatic rifles force the user to pull the trigger every time they want to fire a single shot. Such guns, particularly the AR-15 rifle — which is a modified version of the M16 military assault rifle — have become the weapon of choice in many American massacres in recent years, including in Newtown, Connecticut, in 2012 and San Bernardino, California, in 2015. Such rifles are easily obtained in many U.S. states, including Nevada. But automatic rifles have been banned for civilian purchase since 1986, when Congress passed the Firearms Owners’ Protection Act, which made it easier for Americans to buy many kinds of firearms, but nevertheless prohibited the manufacture of fully automatic rifles. (The NRA’s Wayne LaPierre actually advocated for that provision, which seems unimaginable now.) Automatic rifles manufactured before 1986 must be registered with the Bureau of Alcohol, Tobacco, and Firearms, a cumbersome process. Even before that, the 1934 National Firearms Act, which was passed in the wake of Prohibition-era gangland violence, imposed severe restrictions on purchasing and handling automatic rifles, which involved harsh taxes and fingerprinting. Sales of the guns plummeted after the passage of that law, and their use in large-scale acts of murder in the United States has been unheard of for decades. Still, there are hundreds of thousands of automatic rifles in civilian hands, including more than 11,000 in Nevada, according to the ATF. How Paddock got his hands on one isn’t clear. Cell-phone videos shot by concertgoers depict the devastating attack firsthand. Warning: Footage may disturb.